Hello and happy Monday! I hope you had a great weekend. The Husband and I went to a crab feast Sunday. Love love love the taste of Maryland blue crab but don't feel the same about crab picking. I'm still on my Halloween kick. This week I pulled out the My Mind's Eye Haunted papers with the delicious velvety texture. The bat lady illustration is from the magical internet. I truly appreciate sites like The Graphics Fairy which share vintage and antique images. The flocked background is MME's "Harlequin" paper and the while swirl layer is found on the B-side of "Halloween Checklist". [Yes, I'm showing my age...]. Other layers are made from Bazzill Basics. The bat background was stamped with Distress Ink in Black Soot, then each bat was covered with Rock Candy Stickles. This is one of those cards that looks much better in person - the bats are pretty cool if I do say so myself! 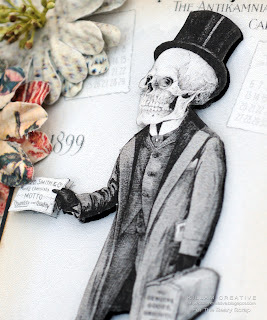 *ahem* I used a blend of Dusty Concord and Black Soot Distress Inks on the edges, then sewed them together. 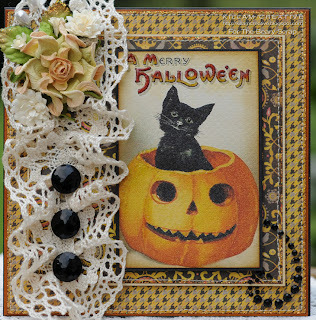 All embellishments are from my stash, including really cool web ribbon that Patricia sent as a RAK last year. I've been hoarding it with 12" left for the next project! Thanks for visiting today! You still have a ton of time to enter your fall-themed project in our challenge. You could win $20 from The Beary Scrap! 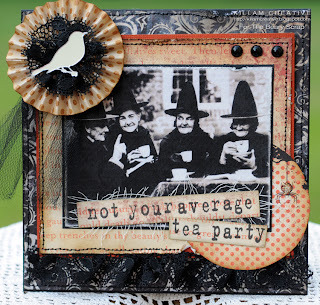 This week the Beary Scrap design team is sharing samples using our new theme challenge "Happy Fall Y'All!" We're adding a little extra challenge to use buttons on our projects. I'm not a button user, I'm a button hoarder. I love vintage buttons and managed to force myself to use three vintage glass beauties. 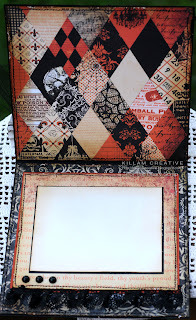 The paper is Authentique's Blissful 6x6 layered on Bazzill Basics orange and ivory. The vintage image is printed on textured paper and enhanced with Glossy Accents on the wording and Rock Candy Distress Stickles on a bit of the pumpkin. Sorry it's not easily seen in these photos; the sun was setting and working against me. The black rhinestone swirl (ooh, could that be a kitty tail?) is Prima Say it in Crystals Black. Thanks for visiting today. I hope you get a chance to enter our Fall-themed challenge before September 30th. There's plenty of time to play with us! Hiya crafty bloggers! Today I want to share a little fun we're having at the Etsy Greetings Team. We're a group of over 100 Etsy greeting card sellers who get together online and share advice on selling, buying and sometimes life in general. It's a great group of individuals from all over the world! 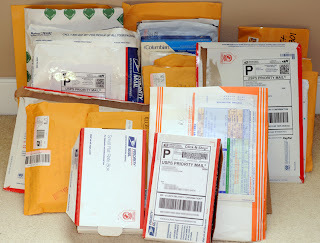 25 Etsy shops sent cards - can you believe it? I'm waiting for one more package to arrive and then I get to sort and send back to the participants. Each shop sent 5 or 10 cards and will receive the same amount in return, but from all different shops. I signed up for 5 so I made five and get to pick 5 from other shops. Oh, the decisions will be difficult! I wanted to make cards that could be sent through the mail in standard envelopes rather than my non-standard boxes. 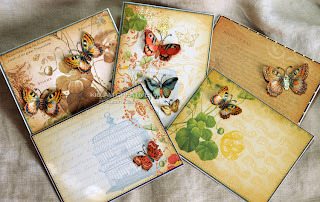 I've been sitting on the DCWV Mariposa paper stack for months, just waiting for the right project to come along. This was it. 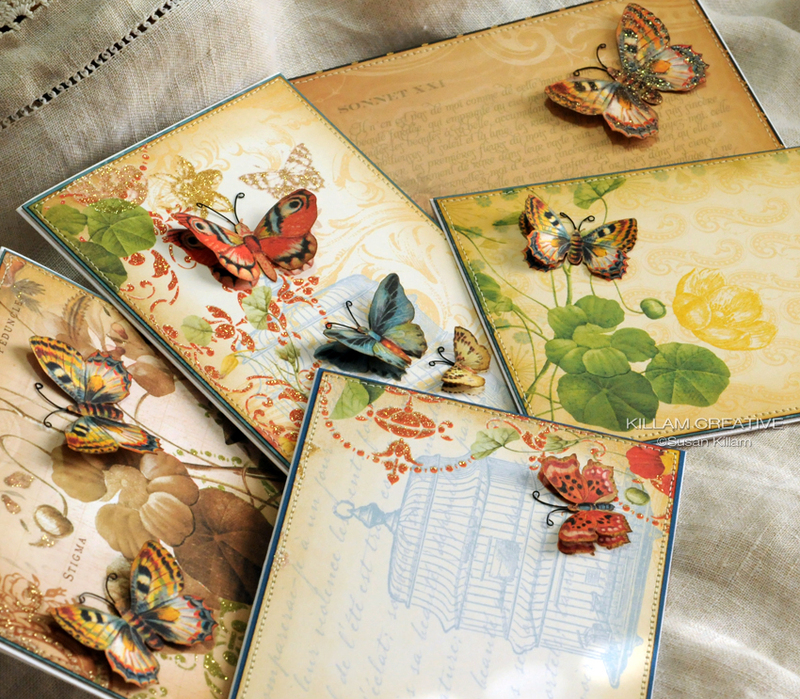 The stack includes 2 of each sheet, so I was able to layer the butterflies for a little 3D effect. The antennae are made from black jewelry wire. 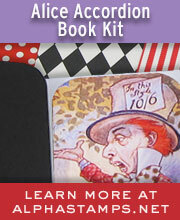 The card fronts are layered and sewn, and the insides are blank. I haven't weighed them yet, but I hope they can be mailed with a single stamp. If you would like to know more about our team, check out our blog. Every day a new card is featured and you'll find a list of member bloggers on the right side! If you'd like to know all of our shops and join our merry band, this page has the low down. And any time you're browsing around Etsy you can find an assortment of our offerings by typing etsygreetingsteam in the search bar. Thanks for visiting today, and thanks to all my Etsy Greetings Team friends - your cards will be in the mail soon! Hi folks! Happy Monday to you. I hope you had a nice weekend. Husband and I took a train up to NewYork to see a Broadway show. I love New York and all the hustle and bustle. I'm not going to take up your crafty time talking about the 9/11 anniversary, but I want to share one little experience with you. As we sat in Penn Station to come home Sunday morning we could hear a pipe and drum band marching by outside. It was 8:35am and up until that moment the Amtrak station was full of the normal buzz. One by one, I could see the recognition of that sound dawn on my fellow travelers. I don't believe there is a sound more profound than a bagpipe, and a band can tear at the fibers of your heart while celebrating life, love and liberty. (Ok, I'm Scottish... can you tell?) The train station fell silent for a bit as we listened. It was a rare, truly poignant moment. 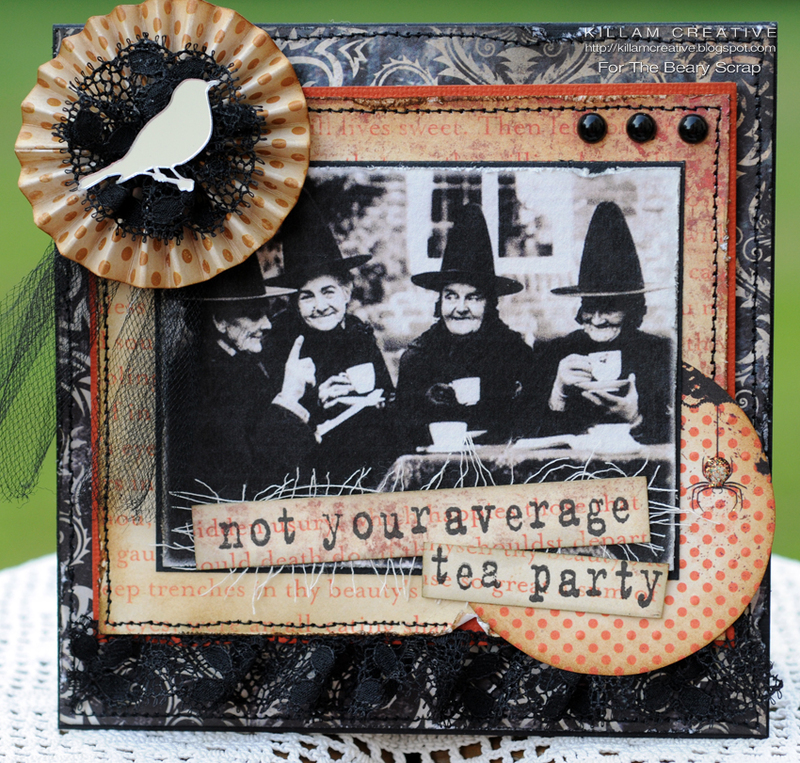 So this week the Beary Scrap design team is wrapping up our September sketch challenge and introducing an oh-so-timely theme challenge. As a way to spice up our final sketch samples Gini, Patricia and I are including our favorite embellishments. How easy is that? 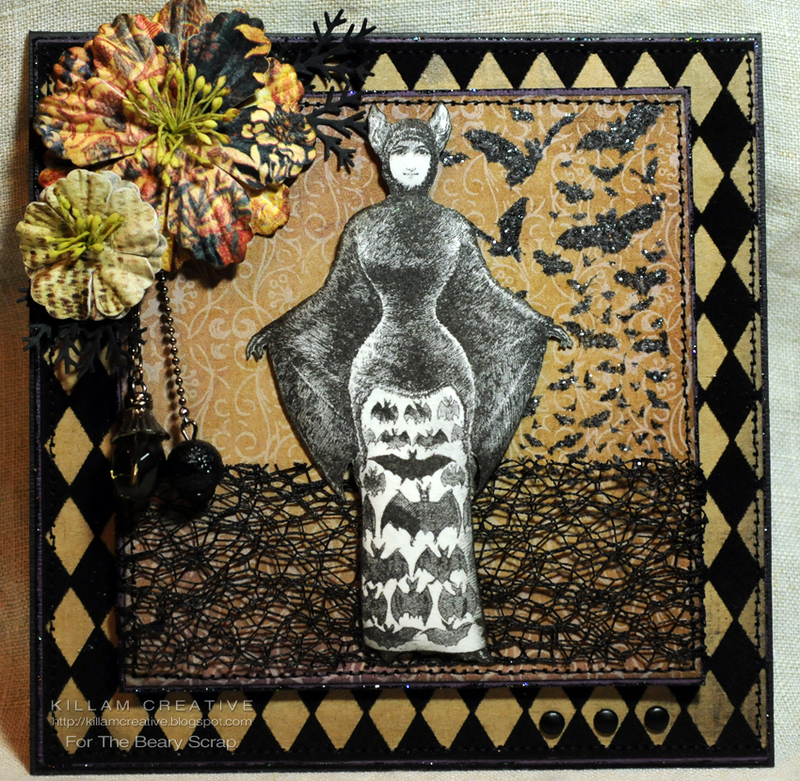 I've used 3 favorites on today's card: lace, sewing and decorative pins! Haha - why chose just one when there are so many? The papers are from Authentique's "Glowing" 6x6 pad, and the image is one of my favorite vintage finds. The skeleton is a bit of a snake-oil salesman, isn't he? I have a whole collection of these Antikamnia Chemical Company calendar images (in full-color; black & white seemed perfect for this card, though). They really are quite amazing! Thanks so much for visiting today! 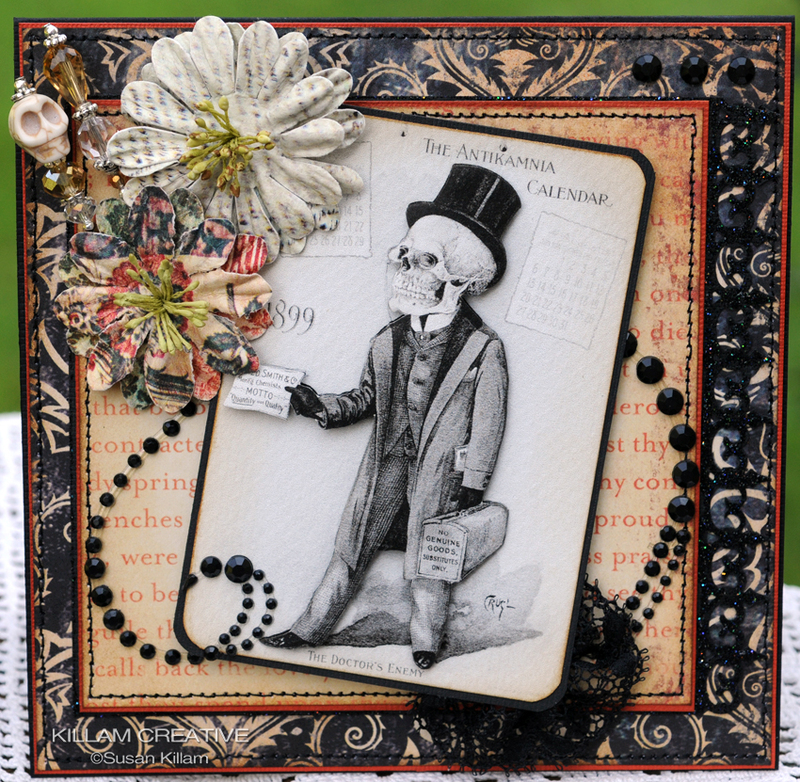 There is still plenty of time to get your September sketch challenge project entered (by midnight EDT Wednesday) - you might win a $20 gift voucher to The Beary Scrap! Hello hello my pretties... It's Monday and time for another project from me! Happy Labor Day to all my US friends. I hope you can relax today! This week the design team is continuing with samples --and perhaps a little inspiration! -- for our brand spankin' new Beary Sweet sketch challenge. I got a little witchy with Authentique's "Glowing" 6x6 pad. I used 4 different designs from the pack, including the polka dot spider. 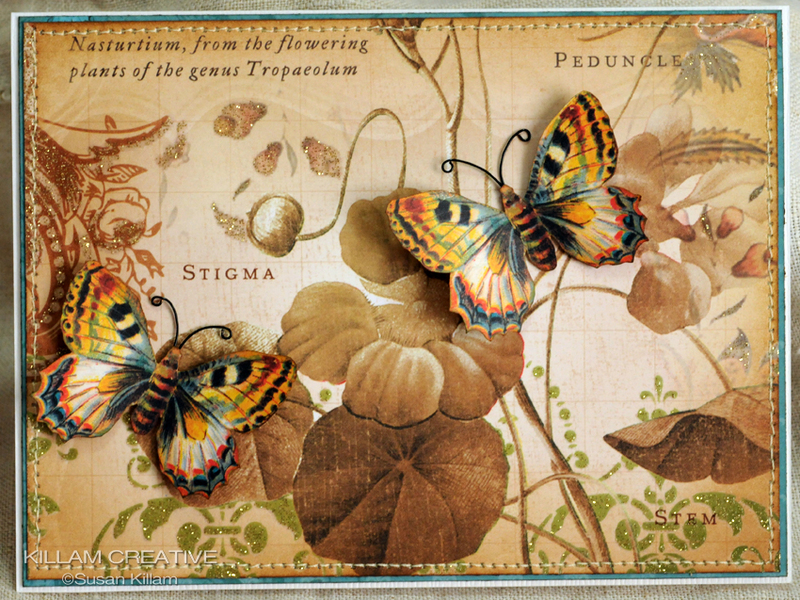 I stamped the sentiment onto scraps created by one of the layers. The stamps are individual letters that I laid out askew for a fun, messy effect. Actually, that's a lot about this that's distressing, including the chewed edges, sewing lines all over the place and pulled edges of the lace and tulle. I was thinking of just using "tea party" and reveling in the double entendre, but decided to steer it in a less *ahem* political direction. The off-white threads behind the top text is a bit of cheese cloth. 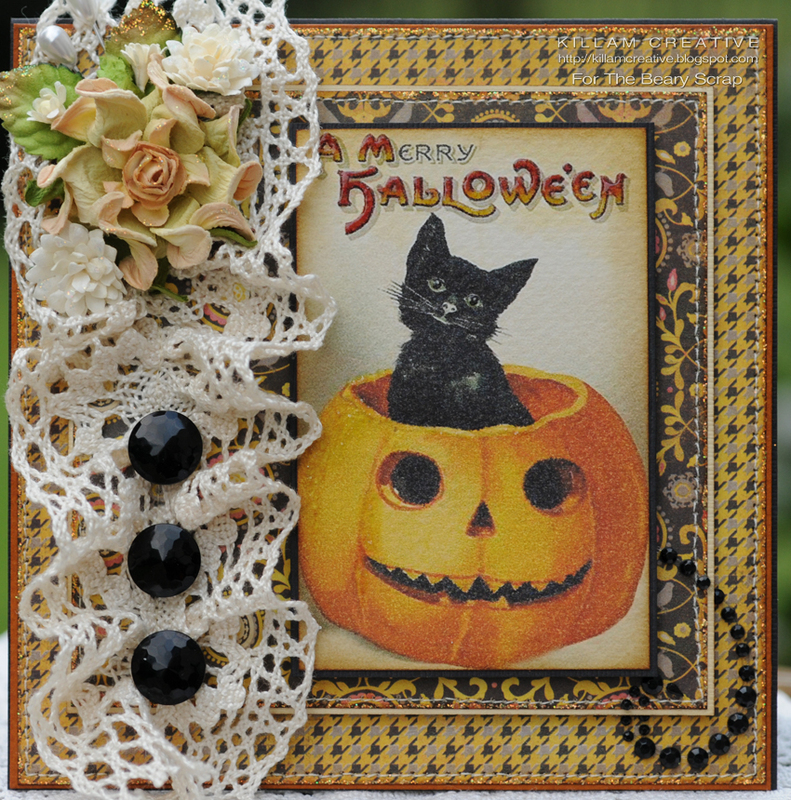 Inside includes a ton of space for a spooky sentiment as well as more lace and a fun diamond pattern design from the stack. Thanks so much for visiting today! We'd love to see what you can create using our September sketch - you could win a $20 gift voucher from The Beary Scrap!